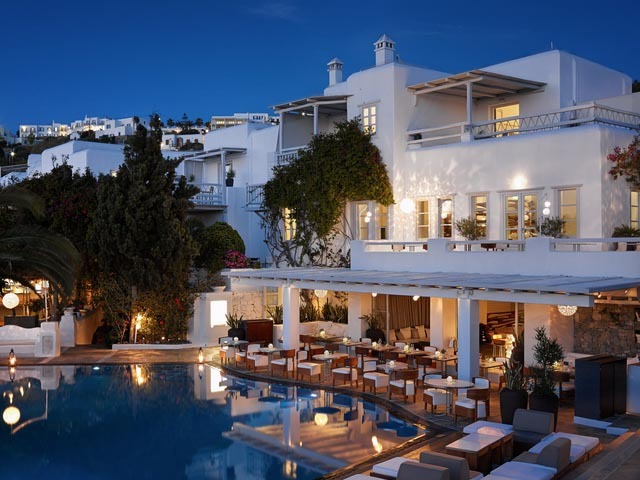 Finding a stylish resort in Mykonos is easy, there are plenty of them. However finding something small and stylish where you can also expect a warm and personal welcome, is more difficult. Apanema Boutique Resort is perhaps the only one. For those who are looking for a private and refined location, Apanema Boutique Resort is a set away from the island’s vibrant lifestyle. Apanema Boutique resort is the ideal refuge for those looking for a romantic atmosphere with a unique panorama giving onto the Aegean Sea. Apanema Boutique resort is a small resort with only 17 rooms (and suites), offering intimate, elegant but relaxed surroundings. 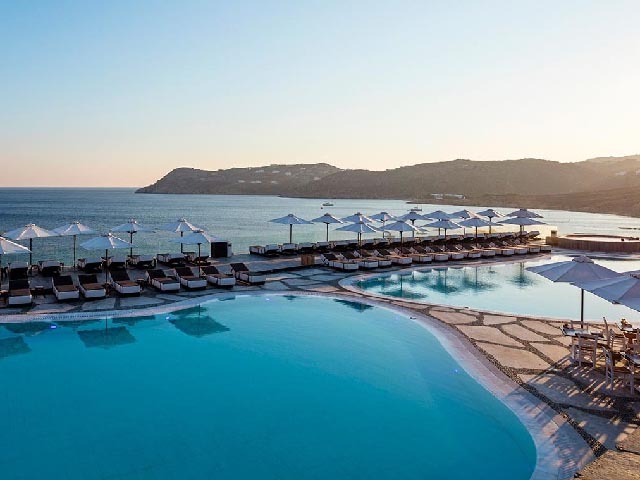 It is located in the Tagoo area of Mykonos, directly on the waterfront with its unforgettable sunsets and views of the nearby Delos Island; but it is also extremely close to the animated town of Mykonos which can be reached on foot in less than 15 minutes. The excellent service completes the picture of a perfect holiday. 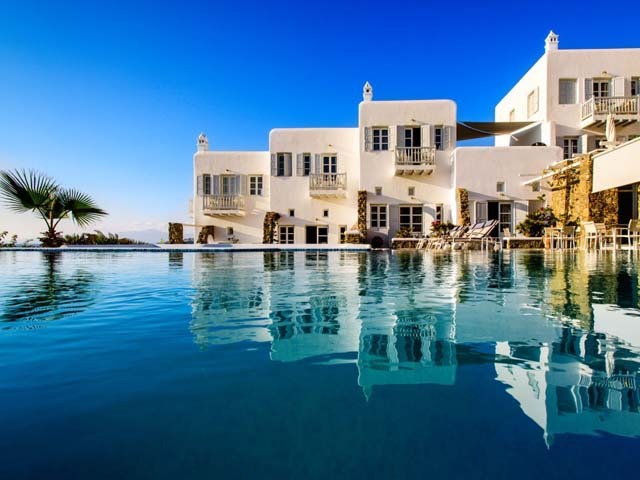 The professional staff are at your disposal until the early hours of the morning, offering a high standard of service and the reception staff are always happy to help you make your every wish come true and are more than pleased to offer you any assistance concerning your travel arrangements or sightseeing on Mykonos. Apanema is a very small hotel with just 17 rooms/suites offering an intimate, private, friendly and relaxed surrounding. 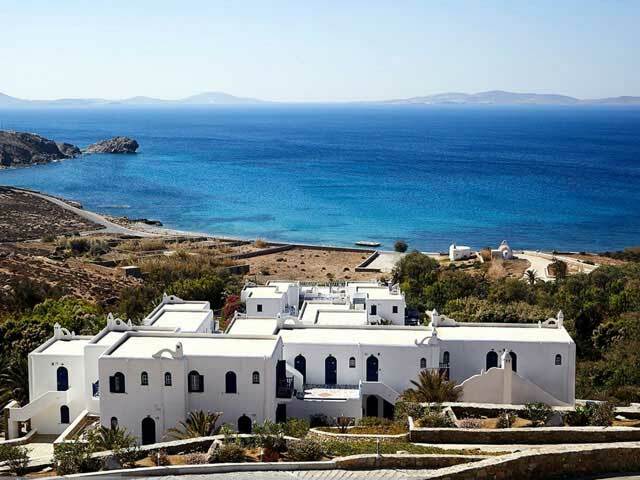 It is located right on the waterfront, in the Tagoo area which is right next to the Mykonos Town or Chora, with sunset view, and less than 10 minutes away by foot from Mykonos Town center. Room with side partial sea view, king size bed or two twins, Radio-CD player set, satellite TV, mini-bar, A/C, Wi-Fi internet access, safe, hairdryer, working desk, Bathrobe and slippers, Luxury toiletries, Fresh fruits and bottle of wine upon arrival.All rooms of Apanema Resort are spacious with Aegean inspired ambiance. Enjoy your stay in a softly decorated, discreet, modern style, quarters. Choice of king size or twin size bed and, in the case of triples, an additional bed. You will enjoy a spectacular side sea view or direct sea view from your private veranda or balcony. Room Size: 30 m2. The open air swimming pool, with a children’s pool located directly alongside, gives you the opportunity to have refreshing dip or to keep fit. From there, thanks to the infinity effect it seems that you are swimming directly in the Aegean Sea. Comfortable sun loungers with shady umbrellas are located directly next to the pool and towels for the guests are provided in this area. The multilingual staff at the reception are always ready to help guests until late in the evening and should you need assistance at night there is a night porter available. You can get any tourist information you might need, consult tourist guides and maps of the island, and book excursions. Secretarial services are also available, a fax machine, luggage storage, and currency exchange. The resort organises a shuttle service to and from the airport/port. Bike, motorbike and car rental on site, free private parking. Room service, free high speed WIFI and air-conditioning in all areas of the resort, laundry service, disabled access, garden area, reading room, secretarial and fax services, luggage storage room, credit cards accepted. The Apanema Boutique resort restaurant is centrally situated in the resort complex with a splendid sea view and gives directly on to the infinity swimming pool.Some tables are located inside and others outside, where the alternating of white and wood create a perfect harmony with the sky and sea.It is here that you can begin your day, following the previous night’s entertainment, with a splendid a la carte, full continental breakfast, prepared according to your preferences, until lunchtime! Guests have the choice to enjoy their breakfast in their room or in the swimming pool area.Our restaurant is a true delight for your senses. It offers an instinctive and refined cuisine inspired by the best products and flavors of Greece. Using products of excellent quality, our chef creates original and colorful dishes with an incomparable taste. The bar is located next to the restaurant near the infinity swimming pool, making it the perfect spot to enjoy a refreshing cocktail, a glass of champagne or your preferred drink.